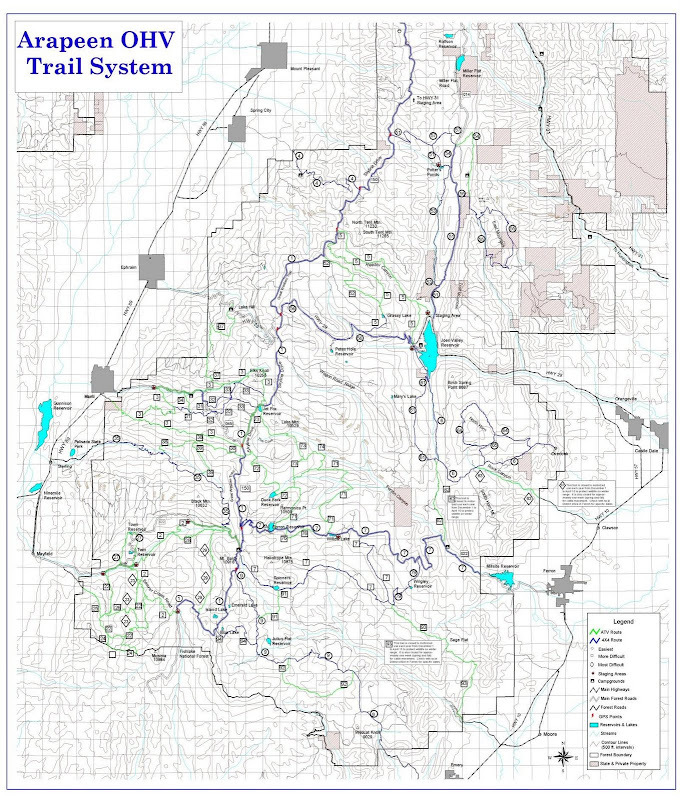 One of the major draws for us in the Blue Lake area is the trail system. The Arapeen OHV trail system is over 350 miles of ATV and 4x4 routes. The loop that we rode last weekend is a very small part of a much larger trail system. This portion, marked in red on the zoomed version of the map shown here, is very family friendly. 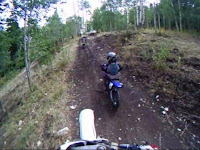 The trail was fairly easy to navigate for our 9 year old son on his DR-Z 110, and had it not been for jetting problems on our TTR 110, I'm confident that our 7 year old would have had little trouble as well. The trail is limited to vehicles with a 50" width, and is mostly smooth double track for the entire loop. There are a few rocks and climbs with roots etc. in them that make the trail more interesting, along with a few mini jumps. 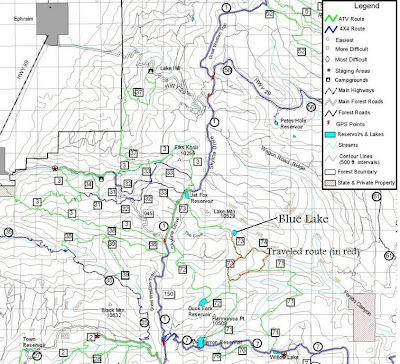 Blue Lake is not shown on very many maps that I have found, and is often referred to as "cove lake" I have added it's approximate location on this zoomed in map along with the location of the trail head on the South end of the lake. The road down to Blue lake is suitable for high clearance 2 wheel drive vehicles, but once past the lake, there is a sign that prohibits anything over 50" in width. Once the main road the duck fork res. is reached on the other side(to the South), it again opens up into a better road suitable to all vehicles. The trail system is generally open late May although high elevation areas may not be accessible until July 1st. Winter snows generally close most trails by early November. The lake is most easily reached by driving from the town of Ephraim, up the canyon and South along Skyline Drive turning left at Jet Fox Reservoir. Blue Lake is located at 39* 12.944N 111* 25.364W and 9,411 feet in elevation on the gps. Check out the video at the bottom of the page of the loop we traveled a few times while we were there. There are more spurs in this area, but this is the one we enjoyed the most. Below is a full version of the same Zoomed-in version of the map above, or click here for a Full PDF Trail Map that shows more clearly the trail with width restrictions/designations gps intersections etc. Here's link to a Few Pics of the camping area and other activities etc. around blue lake itself. is there a way for people to get to the lake from the other side of the mountain directly???? ?i know joe's hole and mayfield from our side and manti canyon but ferron resouvour from ?????? You can get there from Ferron. The road to Duck Fork is pretty good, but you'd need high clearance after it forks off, then something under 50" in width after you intesect with the trail(marked in red on the first map)...or from Ferron, up to skyline and over. We're wanting to go up again sometime..maybe with the trailer near snow's or loggers and explore more of the trail system. The loop by loggers lake is a great section too, and I've been told that at least one trail connects somehow to temple hill resort North of Manti, even though it doesn't on the map. We have relatives that own temple hill resort, so we may stay there sometime and explore too.